Wetherby couple Ann and Ken Wheelhouse say building blocks of love and commitment have helped them reach their Diamond Wedding today. 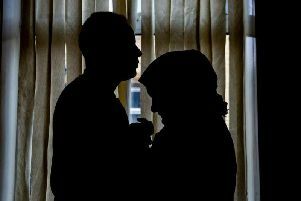 The couple, who now live on Lazenby Drive after moving to Wetherby in 2012, married on December 20 1958 after meeting on a blind date in their home town of Osmondthorpe. She said her parents met when Ann was 17 and Ken 21. Ken, serving his National Service, was in the RAF and Ann worked as a clerk at the Post Office in Leeds. After marrying, they bought their first home in New Farnley, West Leeds, where they brought up their two daughters, Deborah and Karen and lived there for over 30 years before moving to Ilkley near their eldest daughter, post retirement. Ken had run a successful electrical contracting company employing up to 10 electricians and Ann had worked alongside him every afternoon - after she had finished her part-time job at a Bradford accountancy firm - so she could help keep the administrative side of the business ship-shape. Their hobbies included Ken playing football and cricket as a young man and Ann attending keep fit classes as well as flower arranging. Once retired, Ann and Ken travelled extensively and enjoyed several trips to Australia, New Zealand and South Africa. The couple, who are regular faces at the New Inn, have been keen golfers at clubs in the Otley and Ilkley area. Ann no longer plays but Ken has joined Wetherby.